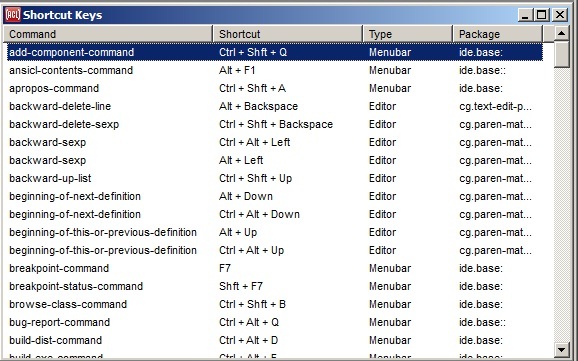 The Type column indicates whether each command is defined on the IDE's menu bar, or by the editor's current comtab (command table), or as a global shortcut. The menu bar keystrokes are applicable in a variety of IDE windows, while the editor keystrokes are applicable only in editor and listener panes. A different set of editor commands, with different keystrokes, will appear in this list depending on the current editor comtab (see editor-mode). Global shortcuts are defined with add-global-keyboard-accelerator. As you select different commands in the list, a brief description of what the command does will appear in the main status bar at the bottom of the IDE. When this dialog is selected, the File | Print command will print the entire list of key bindings, complete with each command's help string. The printed list will be in the order in which the dialog is currently sorted. See also the function comtab-report, which can either present this dialog or print the bindings as a plain text table to an arbitrary output stream. Help on these commands is not directly accessible from this dialog. To find the documentation for the menu bar commands, expose one of the pull-down menus, highlight one of the commands on it, and press the F1 key to show the help page for that menu. The editor keystrokes are documented only in the table below. This table shows the keystrokes of both the Host and the Emacs editor modes (the Brief mode is not known to be used). A triple dash (---) means there is no keystroke for that command in that editor mode. This table was generated by a call to comtab-report. If you would like to use the IDE editor's keystrokes in a Common Graphics application, the functions cg-host-comtab and cg-emacs-comtab return a subset of the IDE editor's keystrokes that are not specific to the IDE. The term "cut" here means to delete text and place it onto the system clipboard. To "delete" text simply removes it without placing it onto the clipboard. To "copy" text is to place it onto the clipboard without modifying the editor buffer.